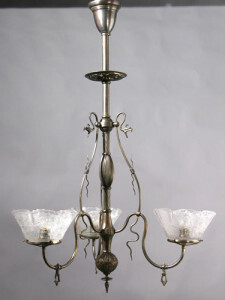 2-Tier 12-Light Antique Gas Chandelier, 2260G. I think the 2260G Chandelier works in this type of Dining room because of its 38 inch diameter. It is a very long Rectangular room (400 square feet ) and the table is very long and rectangular. I think the extra diameter is needed. Plus, I really like the view on the room with the Antique Chandelier framed in the rooms entry as viewed from an adjacent large Living room. I don’t think the fixtures’ diameter is incredibly large. It is the two tiers that makes the fixture appear large. But I do think the 38 inches is needed. My feeling is the 1806GE fixture would need to have more diameter. I also like the chandelier for it’s period appropriateness. 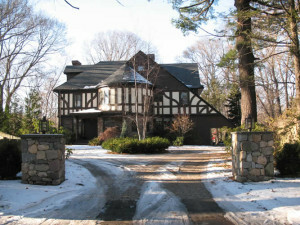 There were probably originally Gas Chandeliers or Gas Fixtures in this Tudor Revival Home’s history. 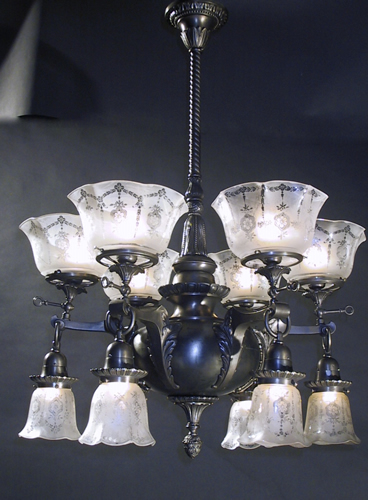 We placed Gas Chandeliers for an 1870 Tudor Style Home in Milton where this idea created some interesting interiors. Wonderful period Home with Antique Chandeliers. and others placed. This chandelier that went in the Study of the Milton Tudor is an Aesthetic Chandelier made by Thackera and Company in the 1880s. There is an understated level of detail but enough to put it recognizably in the period. 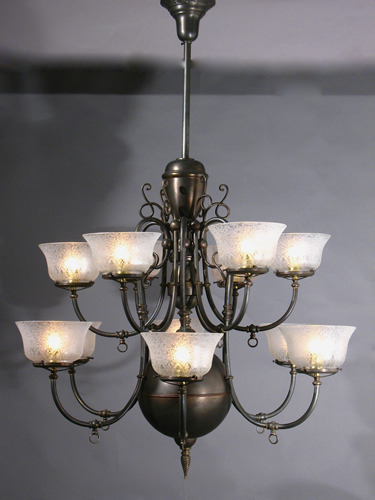 This is what I like about the 2-Tier 12-Light Antique Gas Chandelier in the Dining room. More period detail would make it fight with the existing collected elements. For this reason also I think the size works. I have to be honest, when I got to this Tudor Revival house, the ceiling was 10 feet instead of the 12 feet I thought and I was skeptical. But after setting it up one thing occurred to me and became important. 10 feet is only two feet short of 12. The fact that there is no detail over the two tiers as the pole reaches the ceiling somewhat makes the ceiling height less consequential when it comes to this fixture. I also think the shades on the fixture add an interesting “Sculptural” element to the room. Most of the other detail is in relief so to speak, almost asking for something to “Stand Out”. 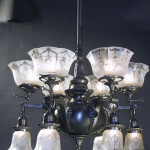 12 of these exceptional quality Gas Shades which are little “works of art in themselves” are quite rare in my business. There was quite a bit of handiwork in the manufacturing process. After the blank was blown there was a stencil created by the artist that would function as a mask to “transfer” the design to the glass through the use of Hydrofluoric acid. The wax mask was actually called a “Transfer”. If you look around the house, the collected elements were obviously chosen very carefully and done tastefully. 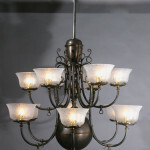 I think this 12-light Gas chandelier would be another appropriate addition and add a historically important element. Also, finding something in the period that will work with collected elements is something we look for in a period piece and is not actually as easy to find as you would think.